(Nanowerk Spotlight) Over the past few years, we have seen an explosion of interest in electronic devices based on paper or textile components. Just take a look at our recent Nanowerk Spotlight "Nanotechnology research produces foldable graphene electronics on paper" and the referenced articles therein. These substrates are attractive because they can impart flexibility and low- cost manufacturing to devices such as transistors, circuits, light-emitting diodes, and batteries. The use of paper substrates also creates a natural opportunity to exploit another property that paper is well-known for: the ability to be folded. Foldable devices can open the door to many different types of device geometries not possible before. Together with the development of paper-based foldable electronics and foldable displays, foldable batteries are important for integration of the power source and other components into a single, entirely foldable device. Besides, they may be useful for powering devices that have limited space on board. Researchers at Arizona State University, led by Candace K. Chan, an Assistant Professor in Materials Science and Engineering, now have have shown that paper-folding concepts can be applied to Li-ion batteries in order to realize a device with higher areal energy densities. "Specifically for energy storage applications, we wanted to see if folding could be used to compact a lithium-ion battery and increase its energy density for a given unit area," Chan tells Nanowerk. "In other words, could we take an otherwise planar battery and fold it up so that it could take up less space while being able to store the same charge as before, just over a smaller footprint?" In this work, published in the September 23, 2013 online edition of Nano Letters ("Folding Paper-Based Lithium-Ion Batteries for Higher Areal Energy Densities"), the team studied the effect of folding on lithium-ion batteries prepared on paper substrates coated with carbon nanotubes. The paper substrates were ordinary laboratory wipes, which are very similar to tissue paper. The carbon nanotubes were coated on the paper to impart electronic conductivity to the paper and allow the researchers to use them as current collectors. "Normally, lithium-ion batteries use copper and aluminum metal foils as the current collectors in order to allow charge to transfer between the electrochemically active materials on the electrodes," explains Chan. "However, these metal foils cannot be folded easily and the adhesion of the active materials onto the foils is very poor after folding. The carbon nanotube coated papers, however, can be folded with minimal change to the charge transport across the crease." She points out that her team also developed a new process to incorporate a polymer binder to the carbon nanotube coated papers to help improve the adhesion of the active materials. "Once we had these conducting paper substrates, conventional active material layers were coated for the anode and cathode and the batteries were assembled using a conventional polymer separator and liquid electrolyte between the two electrodes. Then, the entire stack was folded and electrochemical testing was performed." These results show that not only can both simple – e.g., just a few folds – and more complex folding patterns be applied to paper lithium-ion batteries without significant changes to the battery performance, but that the folding can be used to increase the areal energy density of the battery. Using the Miura-ori pattern – a folding pattern that has been used to fold maps – the team found a 14X increase in areal energy density in the folded cells compared to the unfolded, planar cells. 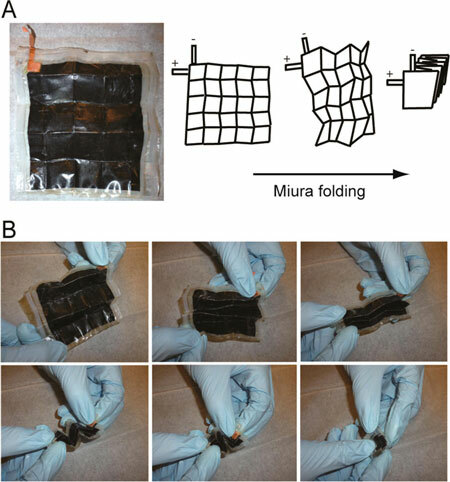 This work is the first demonstration of a foldable lithium-ion battery. With advances in folding algorithms and computational tools to help create complex 3D patterns from crease patterns on planar substrates, there are endless possibilities for using folding to impart new shapes and geometric design to paper substrates. 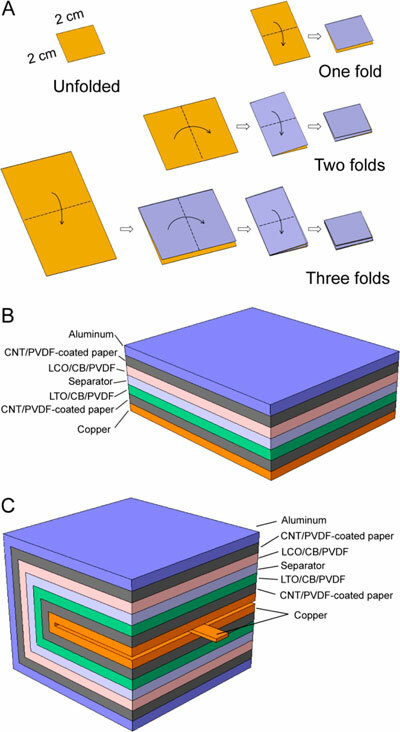 Now, that Chan and her team, which includes professors Hanqing Jiang and Hongyu Yu also from Arizona State Engineering, have shown that paper batteries can be folded just like paper and maintain their functionality, there may be numerous configurations possible for these foldable batteries.